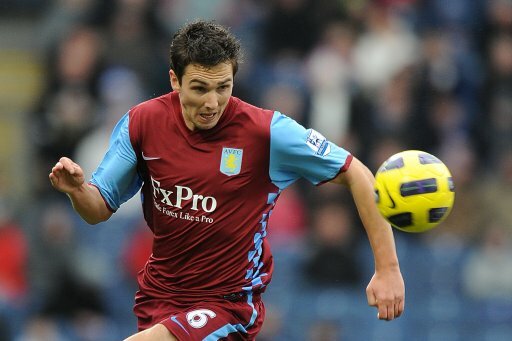 Word is reaching Pies that Liverpool have lodged a bid – believed to be somewhere in the region on £8 million – for Aston Villa winger (and, rather unfortunately for Villa, their current top-scorer) Stewart Downing. Perhaps inevitably, rumour has it that Villa will accept Liverpool’s bid if and/or when they are able to wrap up the prospective purchase of Sunderland striker Darren Bent at some point within the next couple of days. Downing enjoyed a brisk start to the current campaign – coming close to recapturing the form of his salad days at Middlesbrough – though his purple patch has faded to a kind of misty lilac stain of late, scoring just twice in his last 16 games for the Villa. It could just be me, but doesn’t this seem like a bit of a potential ‘Hodgson’ signing? Well we defo need a left-mid and he’s in our price range, so why not? He could be a Hodgson signing in the Meireles sense as opposed to the Konchesky/Poulsen abortion sense. It would be more than 8 million. Arguably Villa’s best player this season and top goalscorer. Bought for £12 million start of last season (only been playing 12 months due to injury on arrival). With Young probably leaving in the summer, theres very little chance of him being sold for less than the £12 milion Villa paid for him. Especially as Villa have no reason to sell him and he is happy. Being realistic 12-15 million is about the price it would take to lure Villa into selling. It’s been so long since Liverpool had a proper winger (Steve McManaman?) … Downing won’t answer this problem either. Could get Seb Larsson for half the price and get the same quality. I suppose he’ll combine well down the left with, erm, Konchesky? Getting sick of the constant useless transfers that come to Liverpool. When are we going to pick up a Van Der Vaart or Xabi Alonso, world class talent for a discount price? Liverpool did have a Xabi Alonso once. He was Xabi Alonso. And he is also the reason that Liverpool are fighting relegation at the moment, his quarterback passing role and shielding of back four gave Gerrard & Kuyt the license to go forward and join Torres. Alonso was ridiculously underrated imo. Anyway!! Downing is a decent signing for Liverpool,surely better than a Maxi/Babel type winger. Downing is a good signing. Players like Turan could come here and not get up to speed for a few months and the team will be stuffed. January is not the time to make expensive signings from the continent. We need proven EPL players. Considering how poor Villa have been lately, it is no surprise he has not played so well in the last few weeks. He was their best player, by a mile, at Anfield, though, and when I’ve watched Villa play he has played as well as, if not better than, Ashley Young. I reckon Villa are a good club to approach at the moment. A lot of players seem unhappy there and they will probably step up in new surroundings. I would put Agbonlahor in that bracket as well. But after they buy Bent, Villa may well want to sell someone, particularly as Albrighton is coming through. The main problem at Liverpool, though, is the number of soft goals we are conceding. No winger is going to sort that out. A proper anchor in midfield is needed and Wheater from Boro, going for a lot less than Cahill, should be one of the teams targets as well, 3 million is a bargain. loserpool will get their world class players when they become a world class football team again, which isnt happening anytime soon. According to Rory Smith in the Torygraph this morning, this story’s just not true. L’pool _are_ monitoring Young (would be great signing, but unfortuanate “English” premium means ~£15m), and in for a loan deal on Warnock. The Downing thing is possibly a smokescreen. In any case, (after signing Suarez from Ajax) the priority must be on adding natural width to the team, which as Shane points out, LFC haven’t had for a v long time. Hands off our Villa players!!!! I was going to suggest Villa swap him for a Liverpool player but I can’t think of any ‘Pool player that would drastically improve Villa. Reina?